Manager Mark Warburton says he has "no idea" whether Rangers will make a third bid for Hibernian's Scott Allan. The Ibrox outfit have been rebuffed on two previous occasions by their Championship rivals, with their last offer of £225,000 rejected last week. Allan, 23, has intimated he wants to join his boyhood heroes but Hibs boss Alan Stubbs insists he is staying. Warburton said on Monday that Rangers were always looking to add quality players to their squad. Asked whether Rangers will test Hibs' resolve for a third time, Warburton said: "I have no idea. All I'm worried about is my playing squad and my group of staff; that's my only concern. "He's a Hibs player and not our player. I keep saying it but it's disrespectful... any manager of coach should never talk about another club's players." Speaking after Saturday's 6-2 defeat by Rangers in the Challenge Cup, Stubbs said of Rangers' efforts to sign Allan: "They can try all they like. It's not going to happen." Prior to the match at Easter Road, the Ibrox club upped their initial bid of £175,000 for the former West Brom and Dundee United player by £50,000. And former Hibs boss Alex Miller has warned that selling Allan to their league rivals for anything less than £1m could see Hibs lose 5,000 fans through the turnstiles. "If you transfer him in January then somebody will buy him for £150,000; so they're losing £100,000 at present," Miller told BBC Scotland. "That's 5,000 spectators at £20 a time. "I think if Hibs sell Scott just now, for that kind of money, then they'll definitely lose 5,000 spectators between now and Christmas. 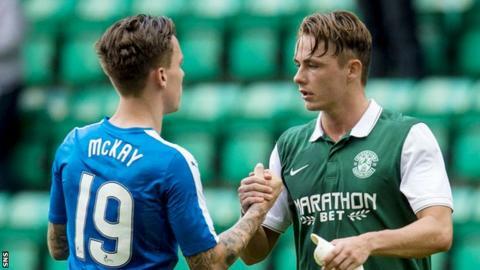 "It's the start of the season, you're fresh and you want to win the league to get promotion but if Rangers are offering £1m then Hibs must take that." BBC Scotland pundit Pat Nevin expects Allan to remain at Easter Road for the foreseeable future. "The manager would be disappointed but also the fans would be absolutely gutted as well," Nevin said. "The fan base wasn't that bad last season; it was pretty good and there was a good number turning up because they were seeing some good football. "If you take out your best player then a number of the fans will be disappointed and it will effect how many will come [to the games]. "Usually in these situations, the player goes and they come to some sort of agreement. In this situation, oddly, I wouldn't be surprised if it went the other way and the player stayed and eventually left next year."